One thing I tend to spend a lot of time on, is my skin. Keeping it glowing and healthy makes me feel a lot more better. I don't have the perfect skin, I wish I did, but I don't. But I do everything I can to keep it healthy. These are more lifestyle-based tips and secrets rather than products (maybe, that could be a second post). Starting off with foods: during the day I am most likely to be seen snacking. I have found Blueberries and Low Fat Yoghurt has become my favourite to nibble on, as well as other various fruits. I also love love love love eating almonds, they are tasty and good for your skin! During the day, it's good to make sure you drink lots of water, something I am not so good at - but I am trying! I also like to have a green tea or smoothie in the morning. Lastly, working out, excercising, yoga, pilates, dancing - that sort of thing - has done some wonders for my skin! I sometimes just watch a YouTube video and work out in my bedroom. 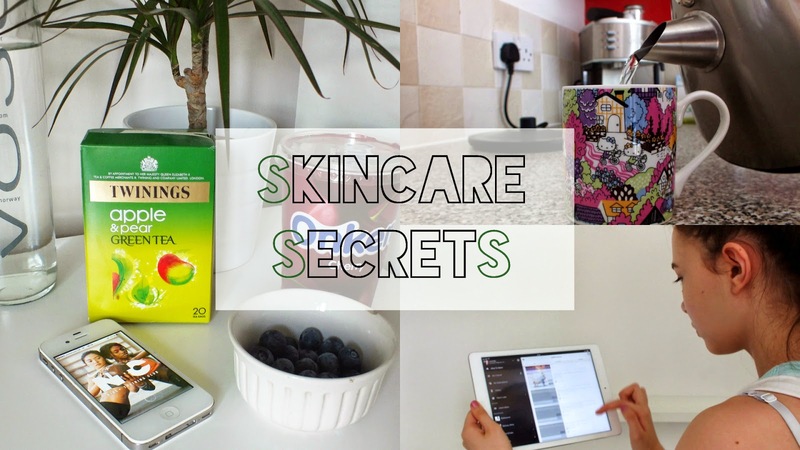 I have made a YouTube video where I show my SkinCare Secrets in a lot more detail, if you'd like to watch, just click HERE, comments, likes and subscriptions are appreciated. Thank you and I hope these tips help! :) I am also going to be using this video as an entry for the Simple Skintern. Lovely post, my skin is finally looking better and i think its definitely down to drinking more water and eating more healthy! I make sure i drink at least 1.5l of water every day at work and it really shows a difference!